Preferences, then click the Refresh button. This site is not optimized for IE Mac. Please use Firefox or Safari. This site is optimized for Mozilla/Firefox, Internet Explorer (Windows), and Safari. You may also upgrade to the newest version of Opera. The Burning Man Festival was founded in 1986, by Larry Harvey, Jerry James, and others, in San Francisco. Although shrouded in legend, the generally agreed-upon tale is that Larry persuaded a group of his friends to burn a life-sized human effigy on a city beach. Whatever transpired that night must have been a good time, because the group returned each year for the next few years to do the same thing, growing in size until finally the San Francisco police wouldn't allow them to burn their effigy. Momentarily discouraged, the group dismantled and packed up their effigy, which had grown in size, and hauled it out to a spot some of them knew of in the Nevada desert, far from the probing eyes of law enforcement. A group of less than a hundred gathered in the Black Rock desert, burned their effigy in peace, and had themselves a great time. Out in the desert, Burning Man flourished and evolved into a truly noteworthy festival, and attracted able collaborators, including John Law and the San Francisco Cacophony Society. The spectacular desert setting inspired many works of sculpture, performance, music and spectacle. The harsh environment of Black Rock - over 100 degrees in the daytime, interrupted by flash rainstorms with high winds, turning to near-freezing at night - ensured that the hardy artists were drawn together in a tight community. Call them pioneers on vacation. The festival organizers have never offered a simple explanation of what the burning of the Man means. Is it a pagan ritual? Human sacrifice? A symbol of renewal and rebirth? Of destruction? In our view, the organizers have wisely avoided imposing a master narrative on the ritual or their event, so that participants can bring their own meaning to it. The festival is certainly not religious, at least in the usual sense, although the rabid devotion of many of the participants may lead one to believe otherwise. 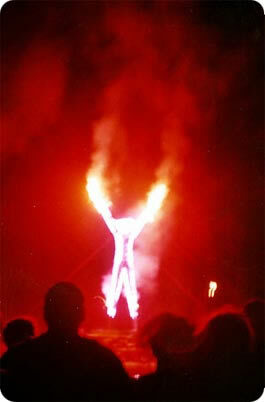 Today, the Man burns brightly, attracting more than 30,000 participants to the Black Rock desert annually. The festival becomes, temporarily, one of the largest cities in the state, and contributes mightily to the local economy. But aside from an admittedly steep admission fee - Burning Man is a legal event, so can you imagine their insurance premiums? - the festival remains resolutely noncommercial. No money ever changes hands, so there's nothing to "sell out." After all these years, and countless visits by news camera crews, Burning Man remains an oasis of eccentricity in the vast sea of mass culture conformity. For more information, visit the official web site of the Burning Man Project. We first attended the 1995 Burning Man Festival, and our fresh impressions are incorporated into the documentary film The Burning Man Festival. In 1996, we built the Couch Potato Camp and the Minute of Fame Booth. These exhibits, and our exploits, are documented in another film, Burning Man: Just Add Couches. In 1997, we returned with a new invention, the Roving Eye. This device, built by Anton Kast, rolled around the playa under an operator's control, videotaping and displaying a live feed. A Mars Rover for our own planet, it was very popular with festivalgoers. In 1998, Ow Myeye joined forces with the Soup Advisory Board. We didn't build anything of note, but rode around in one of the few permitted motor vehicles at that year's festival, recruiting volunteer "Soup Slaves" (don't ask) to pair up with projects which needed labor.